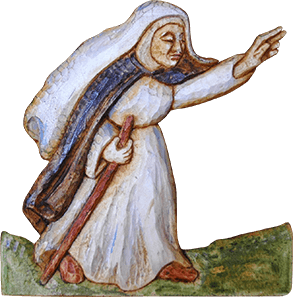 Blessed 'Little' Margaret of Castello – Learn about blessed Margaret of Castello and her amazing life. 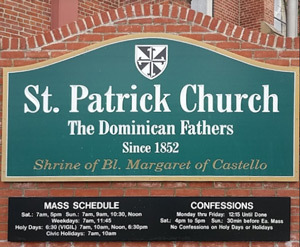 The Blessed Margaret of Castello Shrine is located in St. Patrick’s Church, Columbus, Ohio. The Shrine is a separate chapel in the rear of the church. It consists of a life size statue, a first class relic of her heart, space for prayer, meditation, and blessed candle offerings. The Blessed Margaret Novena and Canonization Prayers are offered along with the veneration of her relic each Wednesday, following the 11:45am mass. Margaret of Castello was born in a small town in Italy in the year 1287. Born with multiple disabilities, her parents were ashamed of her and imprisoned her at the age of 6. They later abandoned her. She lived an incredible life of holiness until her death at the age of 33. Please take some time to learn about her, her life of great love for God and how this humble person who was unwanted and abandoned has a powerful and relevant message for us today. Sadly, we live in a society today where human life is treated as cheap and disposable. The witness of her life demonstrates the inherent dignity of every person, born and preborn, independent of the ‘value’ society puts on his or her life. The message she has for our time is that every life that God creates is worthy of our love.